300 joint personnel of Police, TNI, Satpol PP, Water Resources (SDA) Sub-dept., and PPSU personnel cleaned Jl. Bendungan Melayu, Rawa Badak Selatan Urban Village and Tugu Selatan, Koja, North Jakarta from PKL stalls.
" This arrangement is done to return road's function and control PKLs"
Koja Sub-district Head, Yusuf Madjid explained, this operation was not only done to arrange the area but also to return the road function because formerly many residents complained since access to their settlements was disrupted. "This arrangement is done to return road's function and control PKLs. Thus traffic can be smooth and residents can continue their business," he mentioned, Tuesday (11/6). According to him, there are 198 PKLs who are usually trading in east side of Jl. Bendungan Melayu. After this arrangement, PKLs are still able to trade in west side of the road. Those PKLs are allowed to operate from around 2 AM-9 AM. "We will cut this sidewalk. Besides, we will also apply one-way traffic to south," he asserted. 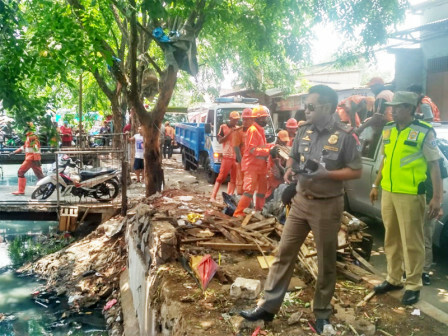 North Jakarta Satpol PP, Ronny Jarpiko mentioned, 20 personnel will be deployed to control PKLs to ensure them for not violating the applicable regulation. When operational hour is ended, patrol car will go sweep the area to remind PKLs to empty the road. "During operational hour, our personnel will ensure the road is accessible," he stated .